Our supreme experience in Spectral Domain OCT allows us to provide the market with the modern OCT offering remarkable simplicity of operation. The new SOCT Copernicus REVO meets all demands in daily routine practice. Small system footprint, various operator and patient positions allow to install SOCT Copernicus REVO even in the smallest examination room. Variety of review and analysis tool give the operator a choice of using it as a screening or as an advanced diagnostic device. Measurement is made without contact, so non-invasive testing with less risk of infection is possible. 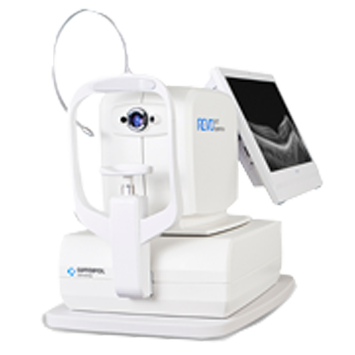 CASIA2 is the latest testing device for capturing images of the lens and the corneal shape. 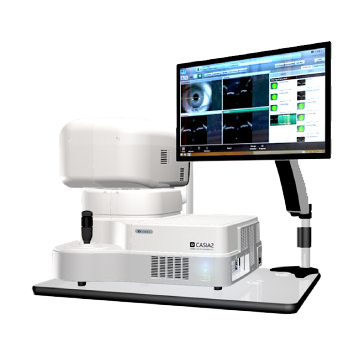 The Cornea/Anterior Segment OCT SS-1000 “CASIA” is a non-contact, non-invasive three dimensional imaging system based on the principle of “Swept Source” OCT. This system achieves high resolution imaging of 10 μm (Axial) and 30 μm (Transverse) and high speed scanning of 30,000 A-scans per second. 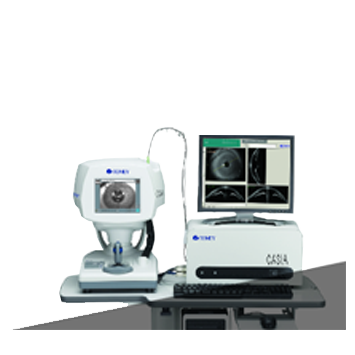 The CASIA is indicated for cross sectional imaging of the anterior segment components of the human eye such as the cornea, the anterior chamber and the bleb segment of the sclera, and also for dimension measurements of these such as curvature, length, area and volume by computed analysis.